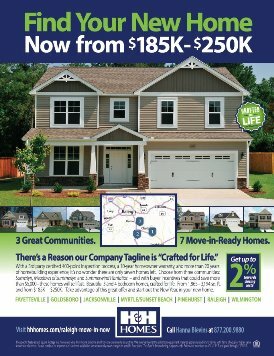 H&H Homes Surges into the Raleigh New Homes Market | ASTRALCOM - Content Strategy, Conversion Marketing and Customer Acquisition. So, essentially, you get a 1-2 punch that covers both traffic and brand awareness. That’s why it’s so effective. Using this multichannel approach, we created flyers, display ads, search ads and social media ads to help H&H Homes increase their brand recognition and ramp-up their activity in Raleigh, NC. After only four days of running the campaign, it’s already a success, with increases in traffic from paid search, display and social up 250%, 100% and 57% respectively. Want to increase your brand awareness among homebuyers and generate targeted traffic to your site? Just contact us and we’ll be happy to explore ideas with you.